So you went to a networking event. You met some really wonderful people. You got their business cards. You think there is some way that you can potentially do business. You left the event after having a great time. You went home. And then… you did nothing! You didn’t send an email. You didn’t call to make a coffee date. You didn’t connect with them on social media sites. You didn’t let them know you were interested in getting to know more about them or their business. Think of Rainmaking as a “Relationship Chain” – a chain of links which ends in business. 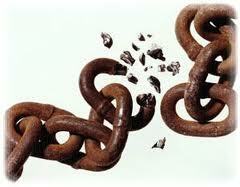 Sometimes these chains are short just a few links long and you get business almost instantaneously. But sometimes these chains stretch for long lengths. Just because you have met someone, or connected with them on a social media site (Linked In, Twitter, Facebook, Pinterest) doesn’t mean you have a relationship chain. Chains are built one link at a time and you need to continually build this chain until it is strong enough to create a relationship which results in business. If at any point you break this chain, you break the ability to further this relationship and it is relationships which bring in new clients and referrals.